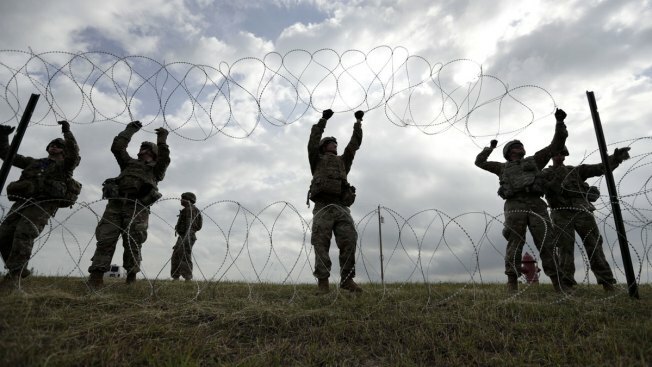 Members of the U.S Army place razor wire for a temporary encampment for the troops near the U.S.-Mexico International bridge, Sunday, Nov. 4, 2018, in Donna, Texas. President Donald Trump's move to deploy troops to the U.S.-Mexico border is so far shaping up to have a cost of $220 million, according to two U.S. defense officials who were not authorized to speak publicly. The initial cost estimate, a figure that could change based on the ultimate size and scope of the mission, comes as nearly 4,000 troops moved to the border Saturday as Trump has repeatedly warned of a caravan of migrants from Central America. In a briefing Monday, however, the Pentagon said it had no cost estimate at the moment. In mid-October, a caravan of at least 3,500 Central American migrants seeking asylum left Honduras for the United States border. The caravan is currently in southern Mexico. The economic cost of immigration detention from CNBC. Trump has made the caravan one of his prime targets as he campaigns for Republicans down the stretch of the midterm election campaign. The president has referred to the caravan as an "invasion" while claiming that Democrats want open borders, which Democrats deny. Critics have called the deployment a political stunt. Defense Secretary James Mattis, however, downplayed that criticism last week. "The support that we provide to the secretary for Homeland Security is practical support based on the request from the commissioner of customs and border police. We don't do stunts in this department," he said Wednesday. A second caravan of about 1,000 to 1,500 people from Honduras, El Salvador and Guatemala, crossed the border into Mexico last week. The Department of Defense estimates that more than 7,000 troops will be positioned in California, Arizona and Texas in support of the Department of Homeland Security and Customs and Border Protection. In which case, the border mission, dubbed Operation Faithful Patriot, will have a larger U.S. military footprint than the combined efforts in Iraq and Syria. However, last week, Trump said he was prepared to deploy as many as 15,000 service members to the border, a move that would be on par with the U.S. troop presence in Afghanistan, which remains America's longest war. The Pentagon and White House did not immediately respond to CNBC's request for comment. The Washington Post previously reported that the border deployment could end up costing $200 million by the end of the year.